Every child loves learning how to make a cookie cutter sugar cookie recipe. I was no different! I was so fascinated by those pretty little sugar cookies decorated for Christmas in green and red. By the way, back then they were nothing compared to the fancy cookie cutter cookies so beautifully decorated for all the holidays today. History tells that cookie cutting and cookie decorating dates way back to the fourteenth century. Many countries like Germany, Switzerland, England and Austria made family traditions of decorating these cookies. Homemade cutters and molds were used to shape the cookies; many having elaborate designs on them. These designs might be painted and decorated to display things like special poems or stories of the Bible. Mom helped me to learn how to make a cookie cutter sugar cookie recipe at home. The problem was that I didn’t have any cookie cutters. The first time Mom showed me how to make them in balls and then flatten them with a glass on the baking pan (we didn’t have cookie sheets) before baking. Before I put them in the oven, I sprinkled them with sugar. These were sugar cookies all right but not fancy enough for me. I wanted the rolled sugar cookie recipe! The next time, Mom let me roll the dough out with a rolling pin and she told me to cut them out with a glass. I did as she said but they still were not fancy. I suppose I could have decorated them like round Christmas cookie ornaments for the tree, but I didn’t have anything red or green to decorate them with. I feel that it is necessary to have a rolled sugar cookie recipe on my list of Christmas cookies not only because they taste so good but they make a beautiful presentation when putting together cookie trays. 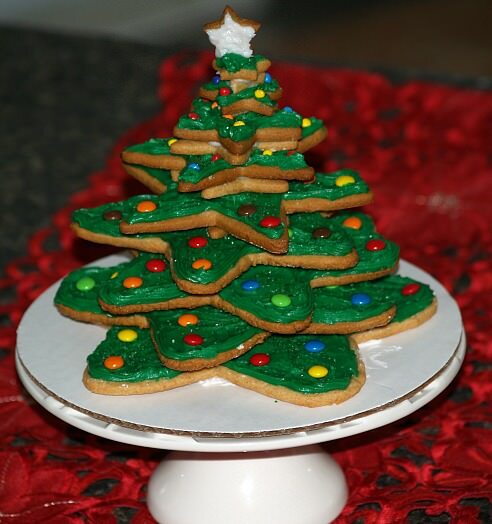 Over the years I have tried many sugar cookie recipes and my favorite is below. It has a very good flavor and texture. Now I have a tub of cutters for all the special occasions and a bunch of stuff to decorate them. 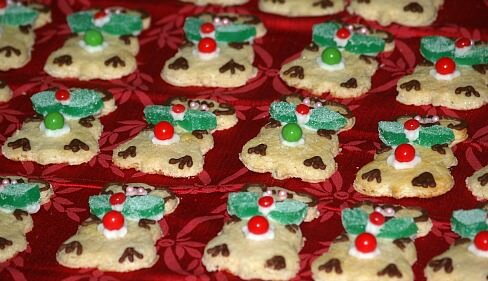 NOTE: To decorate cookies with chocolate, place cookies on a wire rack over wax paper. Dip tines of fork with chocolate and wave the fork back and forth to make wavy lines. Use a cookie cutter sugar cookie recipe to make a festive decoration or give as a gift! Combine and stir together flour, ginger, cinnamon and salt; set aside. In saucepan combine corn syrup, brown sugar and butter; stir over medium heat until butter melts. Stir butter mixture into flour mixture until well blended; divide dough in half. Roll dough on lightly floured surface about ¼ inch thick; cut into 10 graduated stars. Cut 1 of smallest star for top and 9 more for spacers to use between each layer. NOTE: I have a set of 6 graduated stars so I made patterns for the other 4 sizes. Using the largest star cutter set on paper, I increased each of the four by ¼ inch. Lay the patterns on rolled dough and cut around with a sharp knife. You could make these patterns for all 10 if you do not have cutters. ALLOWING space between cookies, place on parchment lined cookie sheets. BAKE cookies about 10 minutes or until lightly browned; cool completely before frosting. Beat on medium speed of mixer the butter, corn syrup, sugar, milk and vanilla until smooth. Tint with food coloring as desired. NOTE: I frosted TOPPER STAR white before tinting. 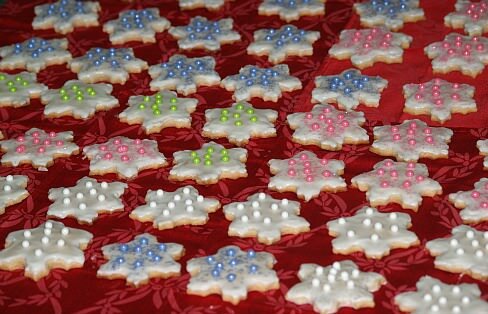 Frost all cookies (except topper) with green frosting and decorate star points with candies as desired. Spread a little frosting on a flat plate or cardboard round; place largest cookie on top of frosting. Place one of smallest stars in the center of the largest cookie; top with next largest star. NOTE: Arrange points of stars so they DO NOT align with the one under it and the one on top of it. Continue layering the cookies in descending order using a small spacer star in between. Add star on the top with a little frosting; add additional decorations if desired. This cookie cutter sugar cookie recipe is made with cream cheese wich give the cookies a firm,chewy texture. Combine butter and cream cheese in a large bowl; beat with mixer until smooth. Add sugars and beat until well blended; increase speed and beat until fluffy. Add eggs, cinnamon and vanilla; beat until combined. In another bowl sift together flour, baking powder and salt. On low speed gradually add flour mixture to creamed mixture. Increase speed to medium and mix until blended. Divide dough in half, wrap in plastic wrap and refrigerate at least 1 hour to firm up. 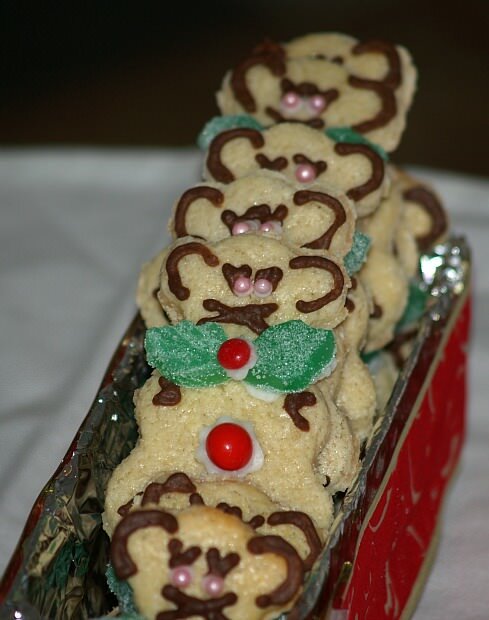 Roll dough to ¼ inch thickness; cut out with snowflake cookie cutter and place on prepared trays. Continue rolling and cutting all dough REROLLING scraps as you cut. Bake 8 to 10 minutes until edges of cookies start to brown; cool cookies completely on rack. Frost cookies with royal icing and garnish. Makes 50 three inch snowflakes. In a large bowl beat water and meringue powder with a wire whisk until frothy. Mix in powdered sugar until smooth; beat in vanilla. Beat together butter and sugar in a large mixing bowl until fluffy; Beat in the eggs. Gradually add dry ingredients to creamed mixture alternating with the lemon juice. Mix well (dough will be soft); divide dough into three parts, wrap and refrigerate overnight. PREHEAT OVEN to 375F degrees; line baking sheets with parchment paper. On floured surface roll out 1 part of dough to ¼ inch thickness; cut with teddy bear cookie cutter. Place bears on prepared baking sheets 1 inch apart; bake 8 to 10 minutes. Cool cookies completely; frost and decorate as desired. Beat lemon juice with powdered sugar; add food coloring if desired. Cream butter, sugar, egg and lemon until blended and smooth. Sift the flour, soda and cream of tartar. Add dry ingredients to the creamed mixture and mix until all is blended. Refrigerate for a couple of hours until the dough is cold and firm. Roll out on a floured board and cut into shapes. Bake on a lightly greased cookie sheet. 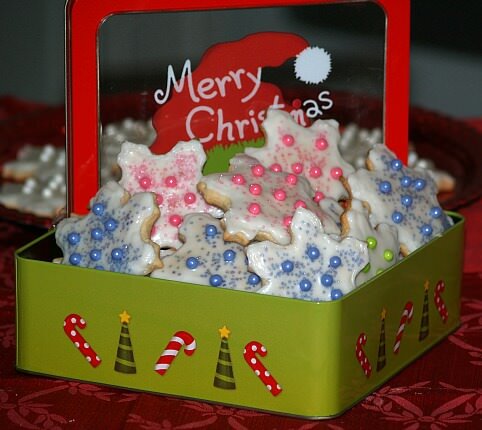 When cookies get cold, decorate with icing or colored sugars. Learn how to make this cookie cutter sugar cookie recipe which are great for kids to make; they love to decorate them and to eat them. Most of these rolled cookie recipes are suitable to decorate and turn into Christmas cookie ornaments for your Christmas tree. After cutting cookies into desired shapes, place on cookie sheets and with a drinking straw cut a hole in the top to insert ribbon or string to hank on the tree. Beat sugar and butter in a large bowl until fluffy; beat in egg, almond and vanilla. Gradually add flour mixture with mixer on low speed; beat until well blended. Form dough into 2 balls; wrap and refrigerate for 30 minutes or until firm. Roll out one ball at a time to ¼ inch thickness; cut dough into desired shapes. Press dough trimmings together and roll out again cutting more cookies. Proceed with process until all dough is used before doing the second ball. Bake 10 to 12 minutes or until edges of cookies are golden brown. After cooling 1 minute on cookie sheet, remove from pan to cool completely. Combine and mix sugar and milk; it will be very thick. If it is too thick add another teaspoon milk. The cocoa powder can be left out of this cookie cutter sugar cookie recipe to make another recipe of delicious sugar cookies. Combine and mix thoroughly butter, powdered sugar, egg, vanilla and mint extract. Stir in flour, cocoa powder, baking soda and cream of tartar; cover and chill 2-3 hours. Divide dough in half; roll each half to ¼ inch thick on lightly floured board. Cut into desired shapes; place on ungreased cookie sheet. Frost with favorite frosting and decorate. Dough should be stiff and moist enough to roll easily, but not so stiff that it will break apart. Therefore measure ingredients accurately for the best possible consistency. If cookie dough is too soft, the instructions should include chilling it to firm the dough. Work with a small amount of dough at a time keeping remaining portion covered to avoid dryness. Roll out dough on a lightly floured surface. A rolling pin with a nonstick surface or a stockinette covering helps the process. Roll out and handle the dough as little as possible for tender cookies. Dip cookie cutters in flour for cookies with clean edges and nice shapes. Follow recipe directions for cookie sheet preparation and placement of cookies on pan to avoid sticking and preserving shapes. Remove cookies from baking sheets as instructed by recipe using wide spatula. (Usually it is let cool on tray 1-2 minutes and remove from pan to cool completely).